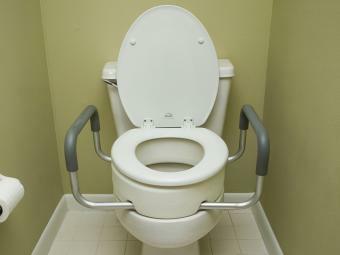 The elevated toilet seat with arms gives the user the elevation of a standard toilet seat but still allows them to use their own seat. Toilet Seat with Arms, Standard Shape. Enables Users To Use Existing Toilet Seats. Padded, Removable Arms Provide Extra Support. Easy To Install Via Bolts And Wing Nuts. Hardware and instructions included. Dimension - 4 x 17.25 x 19.25 in.